5. Any previous VAC bans: None. 7. Were you referred by anyone to join Tango? If so, who? : Nobody referred me. 8. Why do you want to be a part of Tango: I feel I can be a great contributor to the community -- I have extensive knowledge in managing communities in the past, and I believe I can assist here at TangoWorldWide. 9. Can you donate? (This does not affect acceptance): Yes, I am thinking of buying global admin for $100+ sometime later in this community. 10. Do you have any conflicts with our current members? : Yes, I had a few in the past but I moved on. 11. Have you been on Tango's Teamspeak or Discord? (IP:167.114.57.219:9987) (https://discordapp.com/invite/RPStQ9): Yes. 12. What Tango Servers do you play? : Jailbreak, Bhop, Utopia Surf. 13. Write a brief background about yourself so we can get to know you better: I am an 18 year old college student who is pursuing a computer science degree. 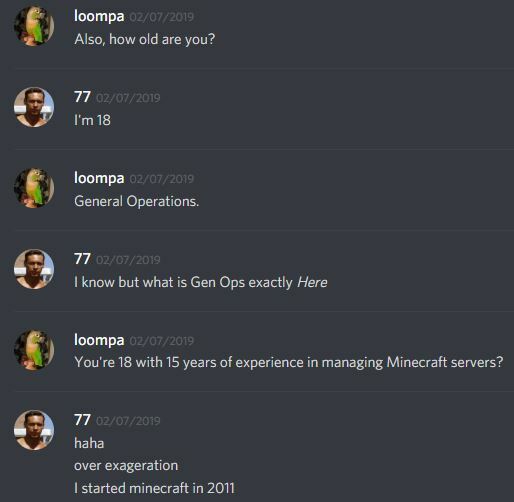 Growing up, I operated online servers in a variety of games such as Minecraft, Battlefield series, CSGO, and Gary's Mod. I have extensive experience in running and operating these servers, while using the plugins like ULX Mod, Most minecraft administrative plugins, and SQL. I have a passion for opening game servers as I love building and dedicating lots of my freetime to them, and gaining experience to give to others. 14. Have you added your steam to your forums account ? Steam Integration (Yes/Non-Steam) (How to): Yes. 15. Are you okay with wearing the required Tango tag upon acceptance? : Yes. 16. You hereby agree to follow our Rules & Policies (Agree/Disagree): I agree. @One- Your application to become a Member has been locked for Staff voting! No further vouches can be made unless the council chooses to postpone this application. Please note that decisions are not made anonymous. If in the event the member gets postponed the application will be unlocked! Please vote "Vouch" - "Neutral" - "De-Vouch". Add feedback only if you know the person and always provide reasons for your vote. If I can't trust a person to not tell the truth, I don't want them representing our organization. On the flip side, they were willing to have a conversation and weren't afraid of speaking out about their ideas. I just don't think calling a lie of that magnitude an exaggeration is exactly honest, at all. Please try to correct your actions so you have better chances of joining TangoWorldWide at a later date. This does not mean you cannot play on our servers (unless you have been cheating). Please remain active if you wish to have another shot in a new application. Please refer to the Rules for more information. You may re-apply in 1 week from the date and time of this reply. *If you re-apply before 1 week from the date and time of this reply, your wait time will increase to 3 weeks.